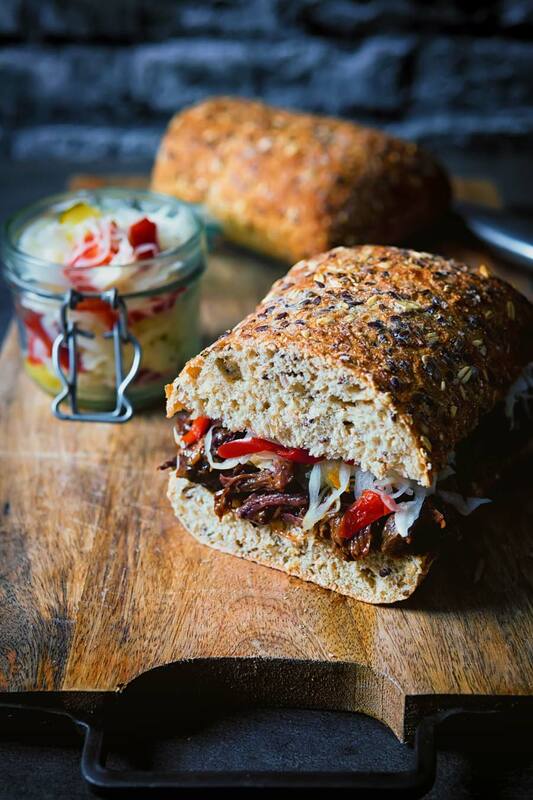 This soft and wonderfully flavoursome BBQ pulled beef is cooked in the Instant Pot and served with a quickened Hungarian pickled cabbage csalamádé and it makes a perfect sandwich filling! Instant Pot Pulled Beef With Quick Csalamádé. This recipe shares something in common with both my BBQ Pork Sandwich and my Pulled Pork Sandwich. 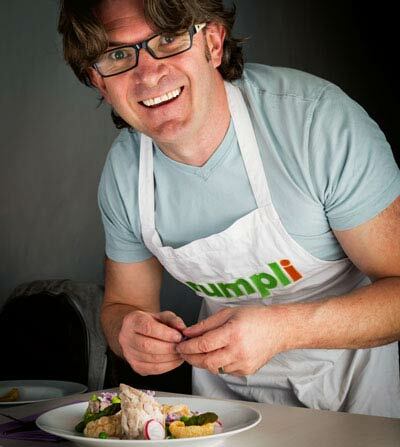 That is the ‘type’ of cooking, all three are gently cooked allowing tougher cuts of meat to become beautifully tender. My pulled pork sandwich uses a slow cooker to achieve this. However, both this pulled beef recipe and my BBQ pork sandwich recipe use an Instant Pot to achieve this. An Instant Pot is nothing more than a pressure cooker at heart. Cooking under pressure increases the boiling point of liquids. This creates a gentle cooking environment but does it in a much quicker way than a slow cooker or other braising techniques. Personally speaking, I very much favour the pressure cooker approach. Not because it cooks things better, but because I get hangry! Seriously the aroma of food cooking all day long makes me want to eat. As a result, I either eat or decide against eating despite wanting to and get all sorts of stroppy! 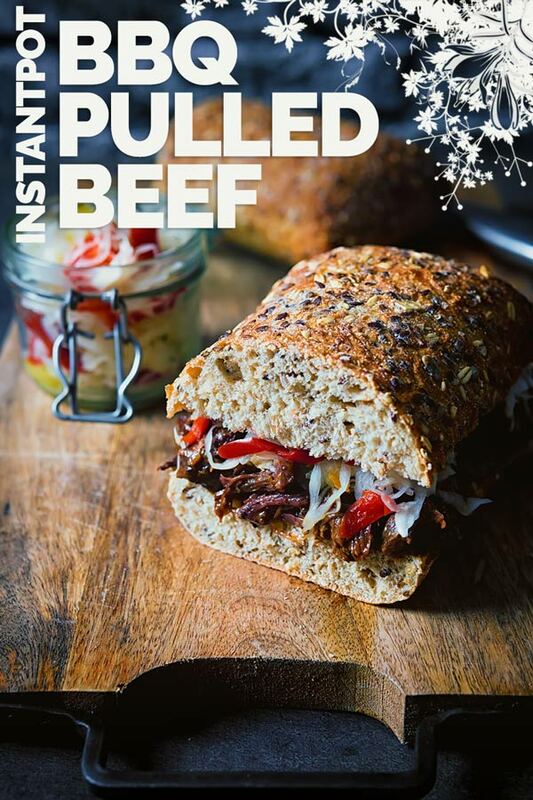 What Cut Of Meat Do You Use For Pulled Beef? 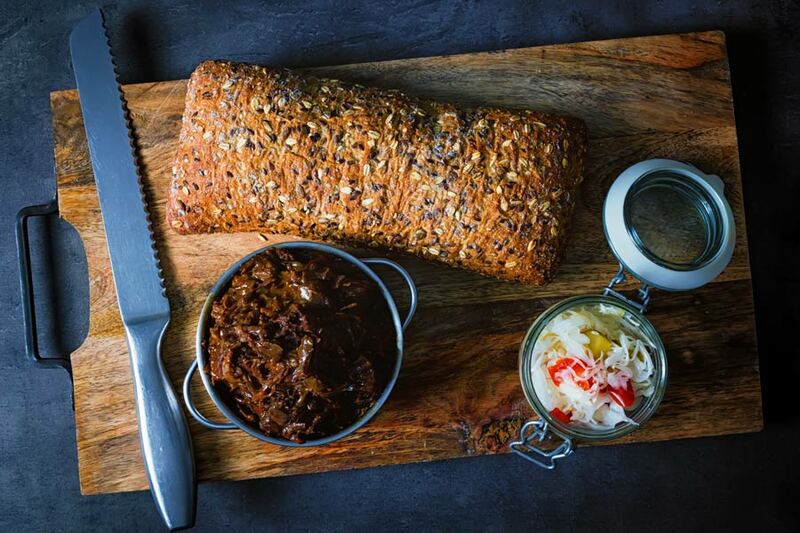 The secret to pulled beef is as much in the choice of meat cut as it is the cooking. Many recipes call for something like chuck or something form the shoulder. This is because it contains a decent amount of fat and connective tissue. This means it takes to longer cooking without drying out and the break down of this tissue makes it easy to shred. I personally prefer shin of beef or beef shank as it is called in the US. It is a cut of beef I advocate using for all sorts of slow cooking recipes. It appears in everything from my Beef Ossobucco to my Beef Vindaloo! It’s lack of popularity mean that it is really cheap at the moment. But it is a hard-working muscle which means that it has an insane amount of flavour. I personally think it has more flavour than any other part of the cow! It is often overlooked because of the large amount of connective tissue it contains. This means it takes a little more work in its preparation in order to cut it into chunks for a stew. But for pulled beef, this is entirely irrelevant. We are shredding this up with a couple of forks and the removal of any remaining connective tissue is easy. You will find it everywhere here in Hungary and it typically contains whatever vegetables are knocking around. The base of a csalamádé is always white cabbage, but it will usually contain peppers and cucumber along with onions. My recipe is a quick approximation of csalamádé designed to sit in the fridge and be used as and when. A traditional csalamádé will be fermented and will last for months and is as much a taste of Hungary as gulyás. 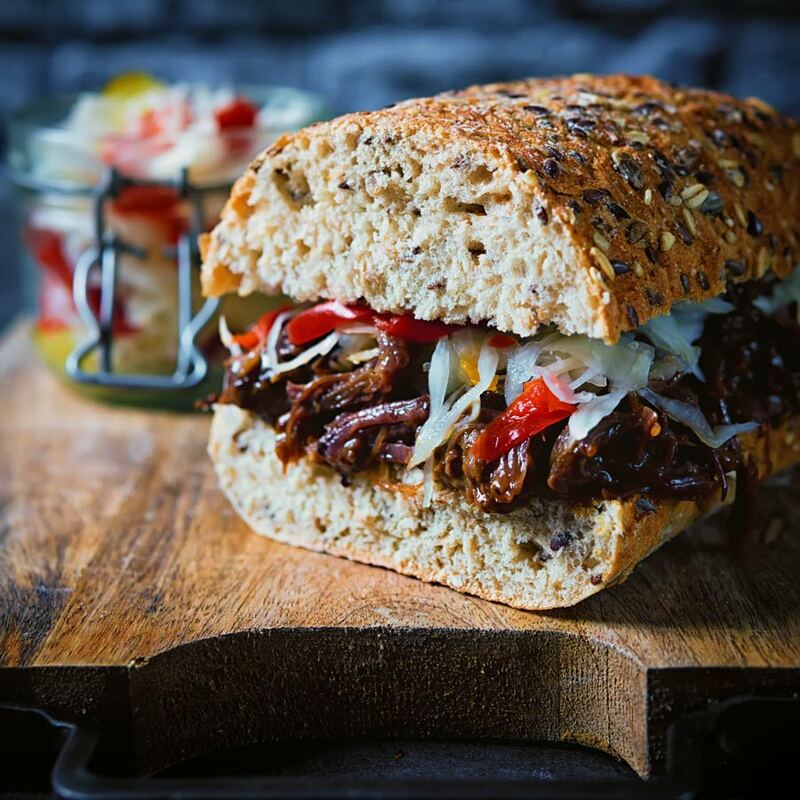 Here it provides a beautifully bright counterpoint to the rich sweet flavours of the bbq pulled beef. Making it the perfect topping as far as I am concerned to a pulled beef sandwich! 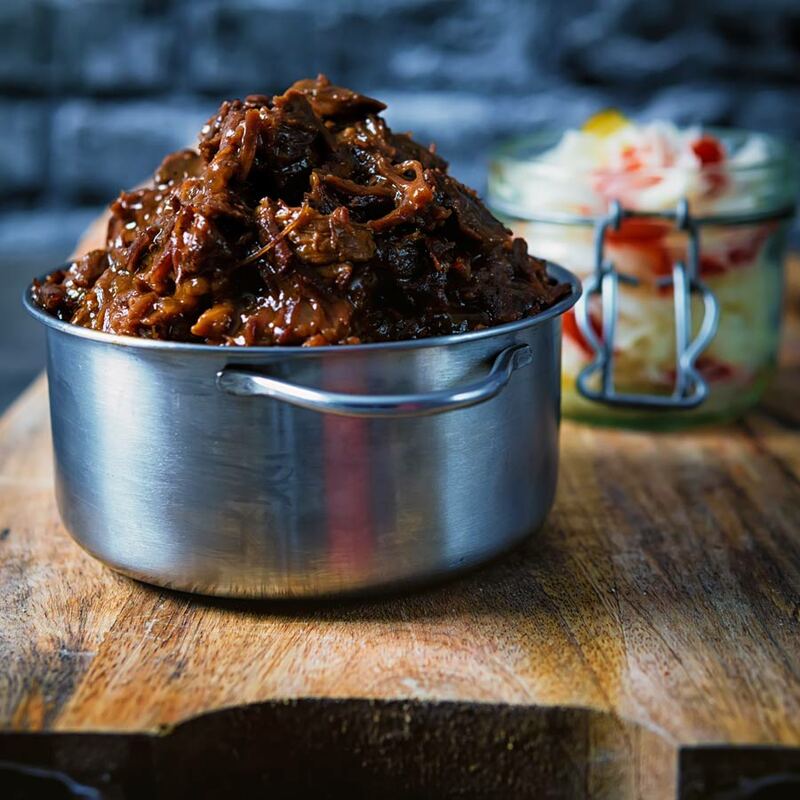 This soft and wonderfully flavoursome BBQ pulled beef is cooked in the Instant Pot and served with a quickened Hungarian pickled cabbage csalamádé. Heat your Instant Pot on saute mode. When hot add the oil and then sear the beef on all sides, do not try and move the beef if it sticks. When it is browned it will free itself. Remove the beef and place on a plate. Chop your onion into large chunks then throw in the Instant Pot and stir for a couple of minutes. Pour in the beef stock and stir scraping the base of the pot to remove the caramlised bits. Turn off the saute mode and then add the beef back into the pot along with any of the resting juices. Sprinkle over the chili flakes and pour over half of the BBQ sauce. Seal the pot then set to manual mode and cook under high pressure for 60 minutes with a 15-minute natural release. Now move onto the csalamádé, remove the seeds from the pepper and cucumber. The slice all of your vegetables to the same size. If you are brave use a mandolin, if not take your time with a knife. Heat a pan over a high heat and add the pepper, mustard and caraway seeds, swirl and toast for 60 seconds. Pour over the vinegar then add in the sugar and salt and stir until the sugar is dissolved. Pour this over the vegetable and the cover with cling film and allow to sit for an hour. When your beef is ready release the lid and remove from the pot with a slotted spoon. Turn your pot to saute mode and reduce the liquid in the pot until is has reduced to 75ml. Add the remaining bbq sauce and the beef and stir to coat. *Use the BBQ sauce that you like the most, I use the BBQ sauce recipe from this BBQ Pork Sandwich which I usually have lots of in the fridge. I like to serve this as a sandwich on some seeded bread but it is also awesome on a baked potato! Nothing beats getting a flavorful dinner on the table and FAST! Such a great idea to make this in a Instnat Pot. Thanks for introducing me to the Csalámadé – it sounds so good! It really is very good, the Hungarians are often known for Gulyás and Paprikás but they make the most insanely good pickles! I love to cook meats in the pressure cooker. Its so much faster because I hate waiting for the slow cooker LOL! The pickled cabbage on this sounds awesome!! Wow what a great photo I am drooling over here! I guess you right about this instant pot, it sure makes that meat fork tender looking! It does do a great job on cheaper cuts of meat! Great idea for lunch. I love it! I am going to try this out. Thank you for sharing this great recipe. YUM!